Fabriano Studio Watercolor Pads are priced for students and beginners yet contain what feels like a professional-grade paper. Available in a variety of popular sizes and two weights, the paper in Fabriano Studio Watercolor Pads is ideal for a variety of media. 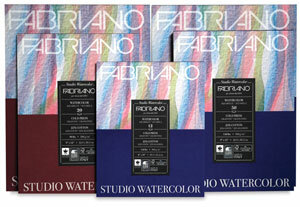 Available in two weights, this paper is ideal for a variety of media, including mixed media, watercolors, and gouache.